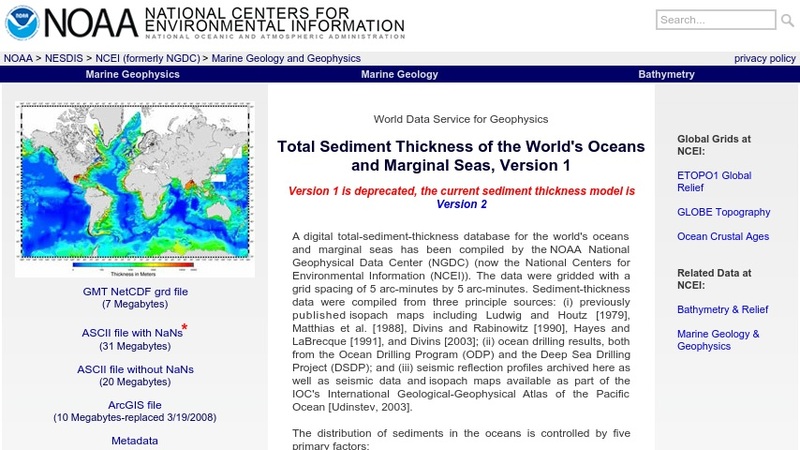 This site consists of a digital total sediment thickness map and database for the world's oceans and marginal seas. The data are derived from previously published maps, ocean drilling results (Ocean Drilling Program and Deep Sea Drilling Project), and seismic reflection profiles (National Geophysical Data Center archives and Geological/Geophysical Atlas of the Pacific). Features include a JPEG image of the map, a downloadable data set available as either a NetCDF grd file or ASCII file, and bibliographical information.